If you can’t get enough spinach and artichoke dip, you came to right place today! 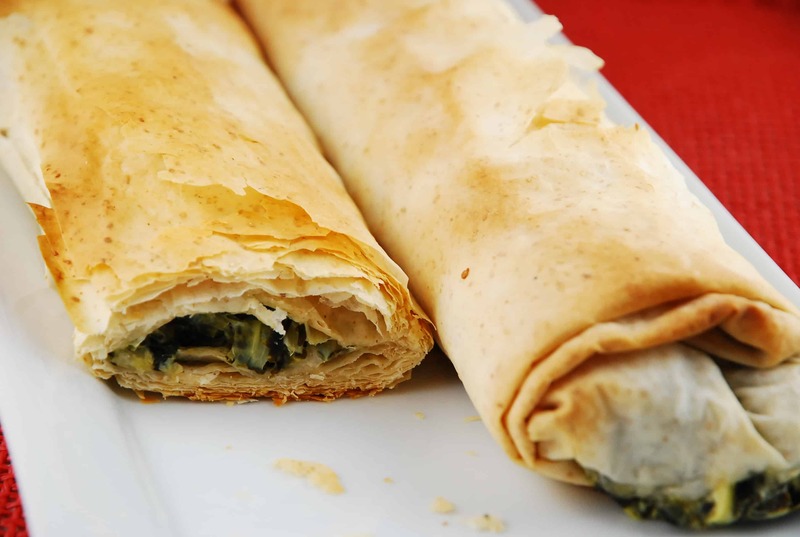 This Spinach and Artichoke Phyllo Log takes a unique twist by putting traditional spinach artichoke dip inside sheets of whole wheat phyllo dough to create an incredible log of mouthwatering flavors – no dipping required. The crispy phyllo makes a perfect vehicle for the creamy, cheesy spinach and artichoke mixture. And the best thing is that this Weight Watchers Recipe is so versatile! I originally made this as a lunch, and ate half a phyllo log with a salad and small cup of soup. But it would also work really well as an appetizer or side dish for breakfast or brunch, simply by slicing into smaller servings. And when a half of a log is only 6 Points this is one dish that you can really enjoy without feeling an ounce of guilt. Spinach and artichoke dip rolled into a log of crispy phyllo, makes for a seriously delicious dish! The creamy, cheesy flavors of the spinach mixture are all there, leaving nothing to be desired in the versatile Weight Watchers recipe. Preheat oven to 400 degrees. Line a baking sheet with parchment paper and mist with cooking spray. Squeeze as much water as possible rom the spinach. Combine spinach, cream cheese, artichoke hearts, mozzarella, parmesan, sour cream and salt and pepper in a medium sized bowl. Lay out one sheet of phyllo dough, and using a pastry brush, gently brush a light layer of olive oil evenly on one side. Add 2 more sheets, lightly brushing each layer with some of the olive oil. Spread 1/3 of the spinach mixture along one short side of the phyllo pile. Fold in the long sides, then roll up to create a log. Place seam side down on baking sheet. Repeat process with remaining phyllo sheets and spinach mixture, creating 3 phyllo logs in total. Lightly brush tops of phyllo logs with remaining olive oil. Place in oven, and bake until golden brown, about 20-25 min. Let cool for 5 minutes before serving. Cut using a serrated knife.